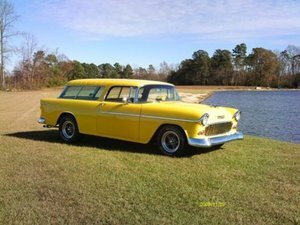 This 1956 Chevy Nomad has a reliable 350 GM small block with 350 turbo transmission, power steering, power brakes, disc up front, and a CPP brake unit. Beautiful interior with new gauges, custom seats, with power front, power windows, and air conditioning. All new exhaust, new tires, and trailer hitch finish off this Nomad just right. Nothing left to do but get in and enjoy the ride. Offered at $64,500 OBO. For more information please visit our website at www.classiccarmarketing.net or call us at 619-972-7073. Please mention the vehicle you are inquiring about so we can respond promptly. Inspections are encouraged before any purchase, of any vehicle, anywhere.